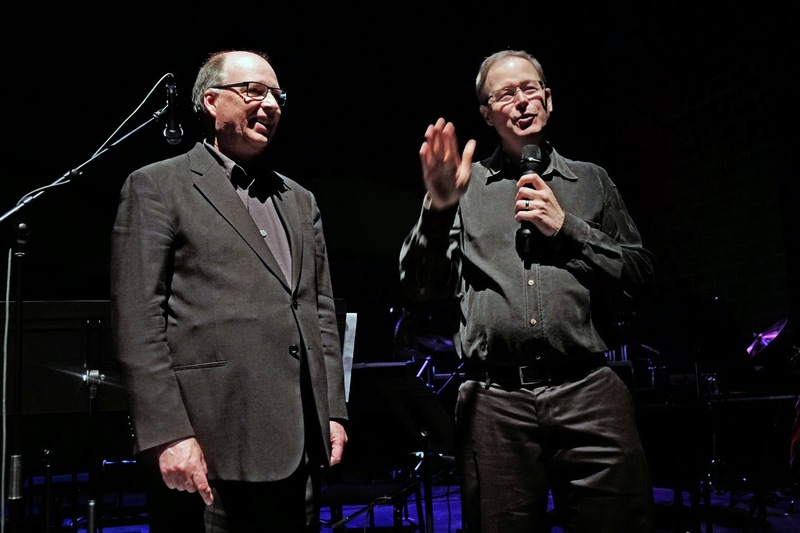 An explanatory account (by that of a non critic and rank amateur) of Turning Point Ensemble’s HyperEnsemble concert presented with SFU Woodward’s on May 2 and to be repeated Tomorrow, Sunday, May 4 at 8pm. My friend Marc Destrubé a noted musician and violinist is the head of the Smithsonian-based Axelrod String Quartet. For many years he was the artistic director of Vancouver’s Pacific Baroque Orchestra. You would think that a man who could play Bach’s Double Violin Concerto in D minor, BWV 1043 single handed (Destrubé is not the only violinist who can do this. There is a story of Isaac Stern being asked at airport security why it was that he had two violins with him. He is quoted as saying, “Because I am playing Bach’s Double Violin Concerto.”) would be in his West Vancouver home, enjoying a needed rest from his busy performing schedule. What would make this man (who also heads the local Microcosmos String Quartet )and many others who happen to play for the VSO, make themselves available to perform last night in the sub-basement (euphemistically called the Fei & Milton Wong Experimental Theatre – Simon Fraser University) at the former Woodward’s building? This cold and almost bleak place would be the safest place in Vancouver during a nuclear conflagration and proof of it is that your iPhone will not work while there! Why would these musicians be on this? My guess is that it must be the challenge of the untested, brand new. We know that Bach liked coffee and that one of his pastimes when he was not composing or engendering offspring was to participate in the computer games of his age which was to write canons on bits of paper at the local coffee shop. Other composers did the same. They would then sight read the papers and laugh at the combinations of compositions that combined stuff that was up-side down, right to left, etc. These canons, some say, were never written to be performed, even though they are now frequently part of the repertoire. In the 80s I read an interesting short story in Penthouse Magazine (they had fine articles!) about a group of Los Angeles music impresarios who decide to bring Domenico Scarlatti from the 18th century in a time machine. They figure the man would throw a bomb into the local musical scene. Their attempt goes awry when Scarlatti becomes enamoured with the Moog synthesizer and drops out from the conventional music business and joins a rock band. I was thinking of all the above when I listened to the first composition (Full Circle, 2014 by Keith Hamel) a piece described as being for trombone, interactive electronics and gesture tracking which featured the solo trombone of Jeremy Berkman, the Co-Artistic Director of the Turning Point Ensemble. You can enjoy that piece and the ones that follow but you best listen to the pre concert talk at 7:15 with Owen Underhill (Co-Artistic Director) plus with the three composers, Keith Hamel, David Eagle and Arne Eigenfeldt). In lieu of that the composers do some fine explaining before each composition. Because I was present at the pre-concert talk I knew that there were eight speakers spread in the room, above and on the sides. I knew that Berkman’s trombone had a microphone attached to it and that a couple of cameras tracked his motions from above. The motion was detected, the ups and downs of the trombone’s slide and of Berkman’s movements. Before the concert Berkman was a tad antsy. He explained that the music he was going to play involved him not only reading music from a monitor but also reading instructions on how to move is body in different directions. 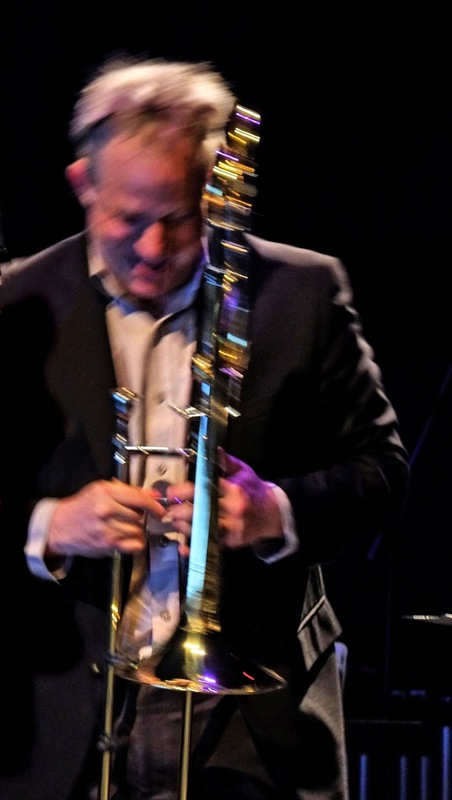 The result of all that (besides seeing up close the use of two trombone mutes, one which when attached to a wooden pole is used by would-be home plumbers) is that the sound of the trombone swished around the room in response to Berkman’s movements. The sounds were sampled and repeated with modifications. 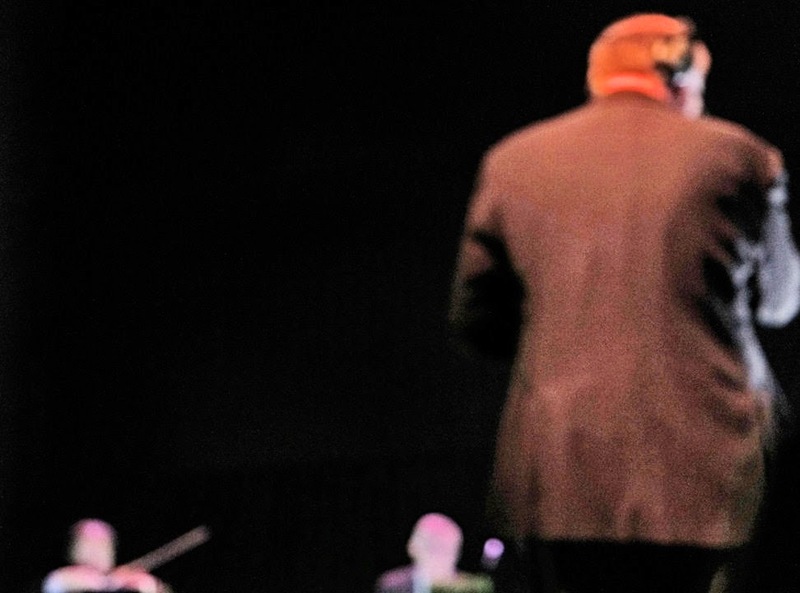 In short it was a tour de force that took me back to the Vancouver Playhouse some years ago when jazz trombonist, J.J. Johnson said to us, “This room has wonderful acoustics.” He moved forward to the edge of the stage and played one of his compositions Why Indianapolis, Why Not Indianapolis? solo. I cannot speak for Bach but I am sure that Johnson, if he were alive would be fascinated with Hamel’s method of displaying the wonders of the solo trombone. The concert featured another solo instrument piece. This was David Eagle’s Fluctuare (2009) for flute, computer in eight channels. Brenda Fedoruk played this. The work did not have a motion detector but it had a microphone to her left which recorded every little variation and nuance of her instrument. I did notice she had (most unusual in a concert of what is now called electroacoustic music) sheet music. But what she was playing was being sampled and modified by David Eagle, who was sitting in the back with his bank of laptops. I found it strange that the microphone was on Fedoruk’s left. I called up Marc Destrubé who succinctly explained that just like sound from whistling in a bottle comes from exactly where mouth meets up with bottle the same applies to a flute. This intimacy of watching Fedoruk interact with her instrument and to instantly listen to modifications swirl around the room made me go into a realm which in plain, but politically correct, language I would only state that flute players must be the best kissers. From my front row centre vantage this intimacy was enhanced. Two of the composers, Keith Hamel and David Eagle, looked like friendly middle aged men. They had quick smiles and an aw-shucks demeanor. They could have explained their music inside a barn. Thanks to their explanations I noted warm moments and humour in their compositions, particularly in Hamel’s Les Cloches (2011/14) for chamber orchestra and interactive electronics. This piece could easily have been explained as variations on the sound of a bell. The third composer, had he been wearing those round eyeglasses like Bruno Freschi and others of his profession, I would have guessed was an architect. He seemed more serious but he was the one who made statements in which he pointed out that the perfection (he did not use that word but I will) of the sound of computers when mated with actual human musicians brought the subtlety of expression and emotion and that he was thrilled to be working (they rehearsed for a full week) with members of the Turning Point Ensemble. It was Eigenfeldt’s An Unnatural Selection (2014, World Premiere and commissioned by the TPE) which was the true cutting edge composition of the evening. The 8 members of the TPE including percussionist Daniel Tones who with his excellent “engominado” hair look could easily channel Rudolph Valentino, and the interesting-shoed Rebecca Wenham on cello, played music displayed on iPads. 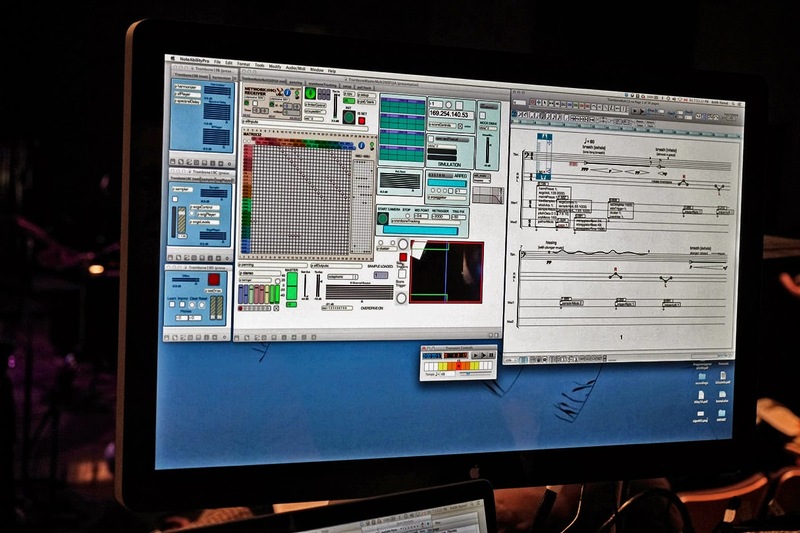 While they had an idea of what the music would be like, it was still being composed by a program (used by all three composers) called Max/MSP so they had to sight read. Besides the 8 live musicians there were three more “robotic” ones, a Yamaha Disklavier and two KarmetiK NotomotoN. 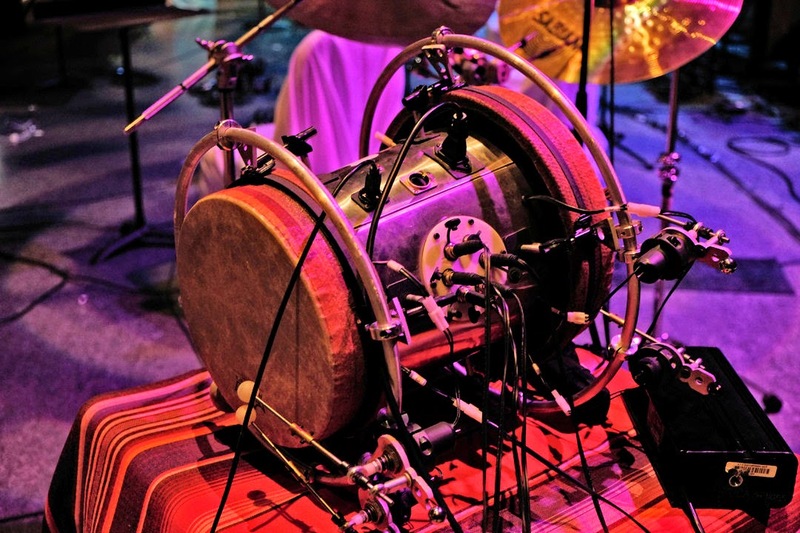 These last two were percussion instruments (they were never intrusive or loud) equipped with many robotic arms. I would have thought that not being sure exactly what you were going to play and when would have made these musicians feel challenged. But that did not seem the case. The surprise for me was to be sitting in back of Owen Underhill who directed while simultaneously watch a score pop up on a large monitor and listening to a click track on earphones. Next to him sitting at a desk (with his back to me) was composer Eigenfeldt who had three monitors in front of him. One of them intrigued me. It had rectangular slots that seemed to match the 8 human performers and the three robots. These squares would all light up or in sections. The first movement 1 imagination is a way – was red, 2 much beauty is before you – was blue and 3 this truth universally was green. 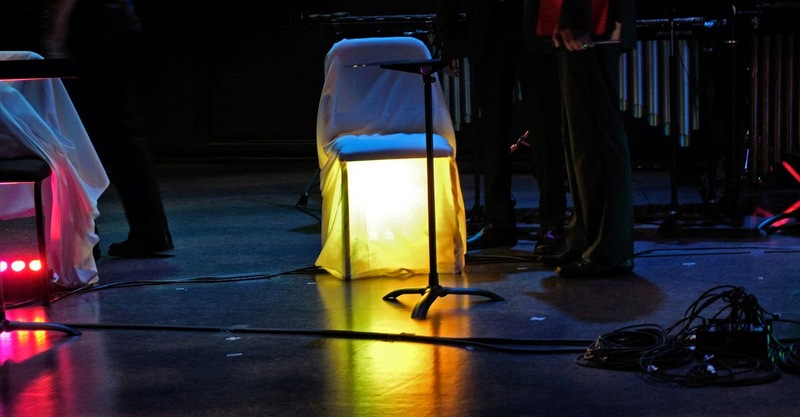 When these lights turned on the colours would match the lights beneath the seats of the musicians (and or near the robotic instruments). The composer explained that this delightful feature (delightful to me) was mostly for our enjoyment but it also gave advance warning to the individual musicians when they would be on. Anybody listening to the 5 compositions of the evening could have enjoyed them with eye-blinds (just for the sound) or visually watching all the goings on. I don’t think I have ever been to a concert with so many wires under the musicians’ feet. 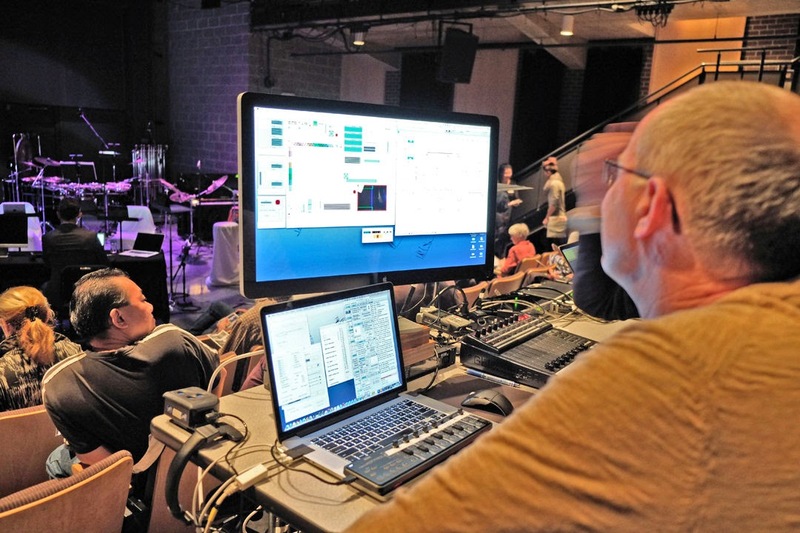 And anybody with an imagination would have wondered that the idea of an audience sitting facing an orchestra and having the sound come to them was the case because there were no other options until now. 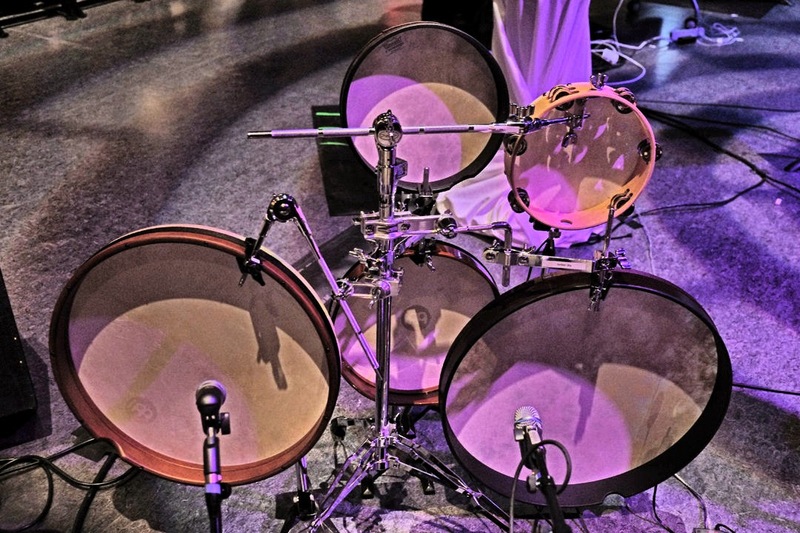 In the past I have been to concerts of the TPE at the Telus Theatre at the Chan that featured individual musicians spread around the performance area, and up and around the different levels of the theatre itself. But with this new method I can imagine Bach’s Double Violin Concerto swirling around the Orpheum. Would Bach approve? 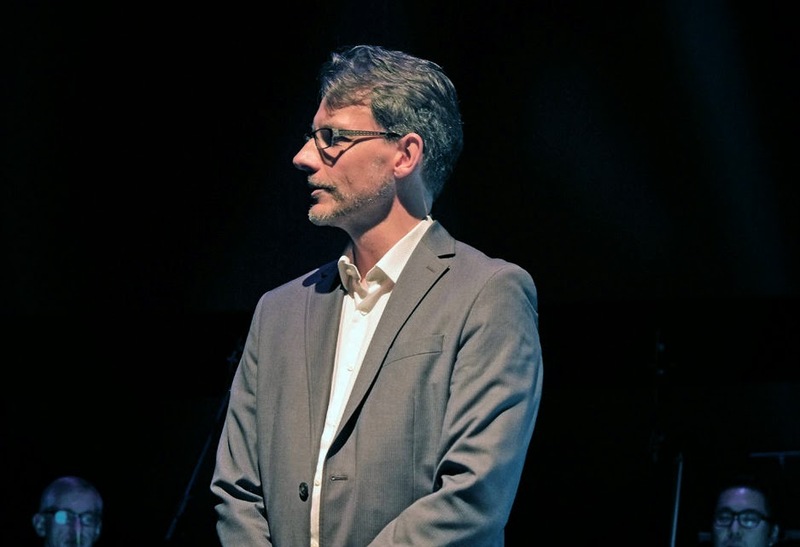 It is interesting to note that two of the composers, Arne Eigenfeldt and Keith Hamel reside in our fair city while David Eagle is not far, ensconced at the University of Calgary. TPE HyperEnsemble will be repeated tomorrow Sunday at 8pm. Generally one is not allowed to take pictures during a performance or at any time before or after. TPE is a bit lax on this but I respect the fact that I should not point my camera at any musician while they are playing. I limit my picture taking to getting a bit of the mood of the location by snapping the instruments. I had not way of taking a picture of a musician sitting on a lit chair (even though I wanted to very much). Because of my use of a Fuji X-E1 set at 800 ISO I am able to get these pictures. I thank my wife for insisting (forcing me in fact) on my buying a digital camera.